Our pick for the best wireless router goes to the D-Link Ultra AC5300. The D-Link Ultra AC5300 emerged as the best device due to its ability to effortlessly stream 4K/HD videos. We were also won over by its speed and the reliability of its Wi-Fi connection. It was a close race for the best two. Our step-up pick is the Netgear Nighthawk X10 AD7200. Its best feature is its integration of the Plex Media Service, enabling you to access and manage your media content from anywhere. It too can stream 4K videos thanks to its powerful processor. For the budget pick, we selected the Asus AC5300, whose best features include high throughput, large range, gaming capability, and built-in protection against cyber-attacks. Routers are indispensable for businesses and for people who have multiple devices at home or in the workplace that require an internet connection. The router is a box that takes a single internet signal and shares it out to each of the connected devices, assigning unique IP addresses to each of them. There are a finite number of IP addresses available, and since each device accessing the internet requires a unique IP address, this poses a big problem: how do you accommodate all these devices? The router solves this problem. There are two types of internet routers: wired and wireless. Wired routers are mainly used by people or businesses that use an Ethernet cable for internet connectivity. In this article, we enlighten you on everything to do with wireless routers as well as provide you with a comprehensive list of the best wireless routers in the market. Each of the unique IP addresses assigned to the devices using the router is a private IP, and as such cannot connect to the internet. It is the job of the Network Address Translator to act as an agent between the public network (internet) and the local/private network. So while only one address is visible to the public network, the private network will have multiple addresses, enabling many computers to use a single internet connection. While the NAT acts as an agent between the internet and your router’s local network, the DHCP server is in charge of assigning the unique IP addresses to the different clients in the network. It also provides other network addresses such as the subnet mask, the default gateway, and the DNS address. DHCPDISCOVER (discovery) – The client broadcasts a message in search of a DHCP server. .
DHCPOFFER (offer) – The DHCP server responds to the DHCPDISCOVER message by offering an IP address. DHCPREQUEST (request) – The client responds to the offer with a request to lease the address. DHCPACK (acknowledgement) – The final transaction is when the DHCP server sends a DHCPACK packet to the client. The data packet contains the IP address lease duration and any other configuration information requested by the client. This terminates the IP configuration process. DHCPNACK (non-acknowledge) – This is when the DHCP server denies the client’s DHCPREQUEST message. It happens when the requested address is incorrect. DHCPDECLINE (decline) – The client sends this message to the server, informing it that the offered IP address is declined because another device is using it. DHCPRELEASE (release) – The client sends this message to the DHCP server to relinquish an IP address and cancel the remaining lease. DHCPINFORM (inform) – The DHCP client sends this message to the server, requesting additional configuration parameters (the client already has a configured IP address at this point). Put simply, routers connect local networks to other local networks or to the internet. Now let’s look at wireless routers and what makes them different from regular ones. The wireless router has two functionalities: as a router, and as a wireless access point (WAP). We have already discussed the main functions of a router; but what is a WAP? A wireless access point is a networking hardware device that enables a Wi-Fi device to connect to a wired network. Using radio frequencies in the 900 MHz and 2.4, 3.6, 5, and 60 GHz frequency bands, the WAP connects devices to the network. In the old days, before wireless networks, setting up a computer network in a home, business, or school required the running of many cables through ceilings and walls so as to provide network access to all the devices in the building. The creation of the wireless access point simplified matters: network users were now able to add devices to the network without requiring any cables, or using only a few cables. The WAP connects directly to a wired Ethernet connection; it then uses radio frequencies to connect the other devices to the network. Wireless routers can also be called WLAN devices. WLAN stands for wireless local area network, which is also called a Wi-Fi network. Depending on the manufacturer or model of the device, it can function in a wired local area network, in a wireless-only LAN, or in a mixed wired and wireless network. The best and latest wireless routers are built based on the IEEE 802.11ac Wave 2 standard – commonly referred to as simply Wave 2. The IEE 802.11 standard defines the protocols that make communications with current wireless devices possible. The wireless devices which use this standard include wireless access points and wireless routers. Most home users connect to the internet wirelessly with a desktop wireless (Wi-Fi) router. This is a device that looks like a small box, and has a short antenna which enables the internet signal to be broadcast throughout your home or office. The further away you are from the device, the weaker the signal the client receives. To counter this, you can have multiple wireless routers strategically positioned throughout the workplace. A powerful processor is the backbone of your device. CPU power has an impact on the reliability of the Wi-Fi signal and connectivity speeds. Speed is the main consideration you make when purchasing the best wireless router. All other factors mean nothing if your Wi-Fi crawls. The best devices operate in multiple frequency bands. There is 2.4GHz, 5GHz, and 60GHz. There are single-band, dual-band, and tri-band routers. There are also multi-band devices that have 4-stream technology. These are more advanced than the others. The wider the area a wireless router’s signal can cover, the more cost-effective it is. Otherwise, you would have to purchase several devices so as to get good signal from different parts of your house or office. The main issue gamers are concerned about, other than throughput/speed is ping. Ping refers to the time a computer takes to respond to a request made by another computer. It’s a pertinent issue in online gaming. When ping is too high, other players in the game appear and disappear, or jump around in an irritating fashion. Low ping gives a gamer an edge, enabling him to move and react faster. After conducting extensive testing and research, we chose the D-Link Ultra AC5300 (model no. DIR-895L/R) as the best wireless router. It’s a bit pricey, but it’s totally worth the cost. It is always better to pay dearly in exchange of great quality and reliability. This is a tri-band wireless device, which means that it broadcasts three different signals, which is like hosting three Wi-Fi networks simultaneously. It hosts one 2.4GHz signal and two 5GHz signals. The 2.4GHz signal supports Wi-Fi speeds of up to 1000 Mbps while the two 5GHz signal support speeds of up to 2167 Mbps. The fast speeds can be attributed to the powerful 1.4GHz Dual-core processor. If you like watching videos, you can count on the ability to stream high definition resolution videos; 4K/HD videos to be precise. Lesser devices cannot handle 4K content. The ability to stream 4K videos will also go very well with games, allowing you to enjoy the best quality gaming experience. When it comes to antennas, the rule of the thumb is the more the merrier. The Ultra AC5300 has eight antennas. That contributes to fast speeds and better Wi-Fi reliability and coverage throughout your home. The Ultra AC5300 is a MU-MIMO Wi-Fi device. MU-MIMO stands for Multiple-User, Multiple Input, and Multiple Output. This is an emerging technology/standard in Wi-Fi devices that enables them to send data to multiple devices. MU-MIMO makes a wireless network operate faster and increases its capacity, enabling it to accommodate more Wi-Fi devices. It also enables simultaneous streaming. We will examine MU-MIMO and SU-MIMO in further detail in the FAQ section. It might have slight issues with range. The price is also quite high, which pushes the device out of reach for those on a budget. However, the higher price is totally worth it since you will get the peace of mind that the best quality guarantees. For the step-up pick, we went with the Netgear Nighthawk X10 AD7200 (model no. R9000-100NAS), which is also an excellent wireless router. This device is extremely fast, enabling media streaming with Plex media server. You can use Plex to aggregate all your personal media and access it from anywhere. Simply connect your external USB or NAS drive to your Nighthawk X10 and organize all your music, movies, and videos. If you want to know more about Plex, scroll down to the FAQ section. The Netgear Nighthawk X10 AD7200 delivers 802.11ac Quad Stream Wave 2 Wi-Fi and 60GHz 802.11ad Wi-Fi, enabling smooth 4K streaming, instant downloads and VR gaming. It’s the best choice if you are looking for a versatile device that will give you great value for each buck. It has 1.7GHz Quad Core processor and a Quad-Stream architecture. This computing power translates to remarkable wireless speeds in the 60GHz range and excellent performance in the 5GHz range. Like our top pick for the best wireless device, the Nighthawk X10 AD7200 is also a MU-MIMO device, accounting for the higher number of wireless devices it can communicate with or accommodate. The best device for those on a budget is the Asus AC5300 (model no. RT-AC5300). Like the D-Link Ultra AC5300, it is a tri-band (dual 5GHz and single 2.4GHz). It has the latest 802.11ac 4×4 technology, which ensures a high throughput of 5334 Mbps and a Wi-Fi signal coverage of up to 5,000 square feet. MU-MIMO technology ensures that multiple compatible client devices can connect at each client’s respective maximum speed. Each compatible device operates at its own dedicated full-speed Wi-Fi connection, and they all connect at the same time without slowing down the network. If you are a gamer, the best feature is that it has built-in access to WTFast Gamers Private Network (GPN) of route-optimized servers. As a result, you can enjoy low, stable ping times when gaming. 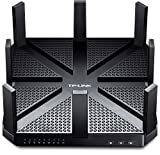 One of the best things about using wireless routers rather than other internet connection devices is the built-in protection against cyber-attacks. The Asus AC5300 has AiProtection, an Intrusion Prevention System that provides your device with multi-point protection for every connected device on the network, blocking all common internet-based attacks such as Trojan virus threats, ransomware attacks, and so on. By switching dynamically between the 2.4 and 5GHz bands on the basis of speed, load, and signal strength, its Smart Connect (a feature that automatically steers clients to the most appropriate band) delivers consisted bandwidth. Computer games have increased in complexity over the years, as game designers increase their skills and players demand more and more complexity. If you are an avid gamer who enjoys great video quality and gaming complexity, the best device for you is the Linksys WRT32X AC3200 Wi-Fi gaming router (model no. WRT32X). One of the best features for gamers is that this device, unlike most, enables you to prioritize gaming traffic within your network. For instance, if someone else is downloading large files on the network, and another streaming a movie, these activities will adversely affect your gaming performance by increasing the ping rate. As a gamer, you desire a ping rate that is as low as possible. With this device, you can prioritize types of network traffic as you wish, which means you can rank gaming as being more important than video streaming, file downloads, and so on. This way, your gaming connection speed maintains a high level, while most of the lag is shared by the other network activities. The Linksys WRT32X AC3200 achieves this using Rivet Network’s Killer Prioritization Engine which reduces peak ping by 77%. Other attractive features that make the Linksys WRT32X AC3200 the best for gamers include MU-MIMO technology; a built-in four-port Ethernet switch (enabling connection of up to four computers); WPA/WPA2 Wi-Fi protection with 128-bit AES link encryption, a fast data-transfer speed of up to 3.2 Gbps and the ability to connect it to printer as well as USB devices for 3G and 4G file sharing. 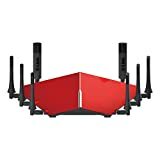 The best family routers should be easy to use, have a good range and a good speed. This is exactly what you get with the Netgear Nighthawk AC2300 (model no. R7000P-100NAS). The R7000P, as it is commonly known, is a popular device thanks to its ease of setting up, its speed and its range. It is a dual-band processor and operates at speeds of up to 1625 Mbps (5GHz band) and 600 Mbps (2.4GHz band). It has MU-MIMO technology and therefore allows multiple devices to stream simultaneously, each at its own maximum speed. At 1GHZ, the dual-core processor is powerful enough to offer good-quality video streaming, lag-free gaming and stress-free surfing. As a device for the entire family, it has one of the best features that parents with young children will appreciate most. It comes with parental controls which enable you to manage your family’s internet use. The internet is a wonderful yet dark and dangerous place. Without adult supervision or protection, it is unsafe for children to wade through alone. Parental controls help give you some modicum of control over your family’s internet use. If your house is large, even a powerful device will struggle to cover the entire house. The signal won’t be as good in the peripheries as it is near the device. To solve this problem you need a Wi-Fi mesh-networking kit rather than a single powerful device. 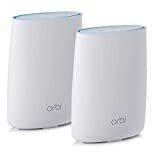 Our choice for the best wireless router mesh kit is the Netgear Orbi Whole Home Mesh Wi-Fi System (model no. RBK50-100NAS). If your house has an area that is above or around 2,000 square feet (medium-sized to large house), you need a mesh-networking kit. Additionally, a mesh networking kit is a good option if you have a small house that has signal-killing interior walls (for instance, lath-and-plaster, brick, or concrete blocks), or a house that has a long or tall, narrow plan, such as a three-story townhouse. Rather than just one wireless device with multiple antennas, the mesh-networking kit consists of multiple access points distributed around your house. This gives you the best range and performance of your Wi-Fi. The Orbi RBK50 covers a range of up to 5000 square feet and offers the best combination of speed, range, features and price. It provides seamless room-to-room roaming throughout your office or home. It has a patented tri-band technology that gives it a dedicated backhaul connection between itself and the satellite, enabling the system to manage multiple networks without a reduction in speed. The best part is that guests can use Wi-Fi without you having to share your password. All you have to do is create a network that services visitors. This is a useful feature for an office space, where visitors are frequent and often need to do something to keep busy while waiting to be served. Meanwhile, the network is safe from security breaches, malware, viruses and worms. The most important things in an office network are speed and the capacity to accommodate multiple users with little deterioration in network performance. MU-MIMO technology is a must-have. After testing several promising devices, we settled on the TP-Link AD7200 (model no. TALON AD7200) as the best device for the office. The Talon AD7200 has fast in-room coverage and uses the 802.11ad standard. With its MU-MIMO technology, everyone in the office will have access to the network, with their devices still operating at high speeds despite the high number of users on the network. If streaming a 4k movie is necessary, you can easily do so on the Talon AD7200. You can also share thousands of files, photos, and documents, using the 60Hz band. It is a multi-band device, operating a 4-stream technology that delivers stated speeds of up to 800Mbp in the 2.4GHz band, 1733Mbps in the two 5GHz bands, and 4600Mbps in the 60Hz band. It also has a 1.4GHz dual-core CPU. While dual and tri-band devices are preferable, if all you need is a simple internet connection and you don’t have “heavy” tasks like streaming, downloading large files and so on, the best option is to go with a single-band device.Consider the Asus RT-N16 Wireless N300 (model no. RT-N16). You need to understand that the speeds you will get from this device cannot be compared with what you get from dual and tri-band wireless routers. For one, single-band devices do not operate in an up-to-date wireless network standard. They mostly operate in the 802.11g or 802.11n standards, while the dual-band devices operate in the newer 802.11ac standard (the newest and best is the 802.11ad standard). Naturally, single-band devices have a lower price. But that is at the cost of Wi-Fi speed and the stability of the signal. They also lack most modern features found in best wireless routers, like app-based monitoring and device prioritization. The Asus RT-N16 provides a performance throughput of 300 Mbps. It has an operating frequency of 2.4GHz. It also has an interface consisting of 5 Gigabit ports (one WAN and 4 LAN), two USB 2.0 ports: all-in-one printer server with FTP files sharing. Where single-band wireless routers support only the 2.4GHz frequency, dual-band devices also support the 5GHz frequency band. They also operate on a newer standard: 802.11ac. Theoretically, that translates to speeds of 2.167 Mbps or more. For the best dual-band wireless router, we picked the Synology RT2600AC Wi-Fi AC2600 Gigabit router (model no. RT2600AC). There are many things to love about this device. Its 1.67GHz dual-core processor provides a fast, reliable performance that makes your browsing smooth and stress-free. It has MU-MIMO technology, allowing multiple clients to connect to the network and operate at each client device’s best speed. The Synology RT2600AC can operate at speeds of up to 2.53 Gbps. It also the Smart Connect feature, which ensures clients are using the most appropriate frequency band (2.4GHz or 5GHZ). This depends on speed, load, and signal strength. Other attractive features include layer 4 and 7 hardware acceleration engine, intuitive setup, management and connectivity, content filtering and parental control, and dual WAN for load balancing and failover support. Tri-band devices are more advanced than the two preceding. They can operate at multiple gigabit speeds, as high as 4,000 Gbps on the 5GHz frequency band. They are called “tri” because they feature one 2.4GHz band and two 5GHz bands. 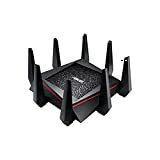 Though we have already looked at several so far in other categories, but for the best tri-band device, we chose the Netgear Nighthawk X6 AC3200 Tri-band Wi-Fi router (model no. R8000-100NAS). With its six antennas and powerful processor, the Netgear Nighthawk X6 AC3200 is able to provide high-speed Wi-Fi to multiple devices. It enables uninterrupted streaming at a speed of up to 3.2 Gbps. The 1GHz dual-core processor includes three offload processors, which helps boost the device’s performance. The Smart Connect features helps to select the best Wi-Fi frequency band for each device, depending on speed, load, and signal strength. While we can’t claim that the devices in this list are the only ones worth investing in (the truth is that there are very many good routers in the market), we can assert, with confidence, that these are the best and are unlikely to disappoint you. We left out a number of devices because of their tendency to freeze or crash when you are using them. You have to keep rebooting them. They wear out quickly. They are easy to hack. They rarely get firmware updates. They are slow. They are simply not reliable. Q: What is the difference between a router and a modem? A: A router is a device that takes a single internet connection and distributes it to multiple client devices. A modem, on the other hand, is a device that modulates and demodulates a signal, converting it into a language your computer can understand – put simply, the modem converts an analogue signal into a digital signal, which is what your computer understands. Some wireless routers can also function as modems. We did an article reviewing the best cable modem router combos. Check it out. Q: What is the difference between network switch and a router? A: Network switches and routers look similar and even perform some similar functions, but they do have distinct functionality in the network. A switch operates as a controller and enables networked devices to efficiently communicate with each other. By enabling resource allocation and information sharing, network switches help increase employee productivity and conserve a business’s money. While a switch creates a network, routers connect networks. It links client devices to the internet, enabling many users to access the internet. The router also operates as a dispatcher, selecting the best path for data packets to travel – it forwards data packets between computer networks. Q: What is firmware and why do I need to update it? A: Firmware refers to software that is embedded in a piece of hardware. Software specifically designed to animate this particular piece of hardware, giving it life and functionality. For instance, the software in your TV remote control is what makes the remote useful. Same thing for the software in your PC’s motherboard or your smartphone. You can install and uninstall regular software as many times as you wish, but firmware is rarely updated – you do so when asked by the manufacturer. Manufacturers release firmware updates so as to keep the hardware compatible with the latest media. Your device manufacturer provides firmware updates for the specific make and model of the device, and you can access these updates on their website. You can also use a tool within the administrative console of your device (which is usually accessible via a web browser). Manufacturers put out updates on a router’s firmware for various reasons, such as adding security features or fixing certain vulnerabilities that a particular model may have. As new bugs are discovered and corrected, updated firmware is released. Manufacturers also provide firmware updates when they upgrade certain features – for instance, to replace outdated encryption modules or to add new security mechanisms that lacked in preceding firmware versions. In addition, the manufacturer may issue firmware updates to help improve your device’s best overall performance. Q: Shouldn’t I just get a cheap one? A: Cheap is relative. I would say if you are looking for something that gives bang for your buck, but you don’t want to spend too much on it, go for a device in that sweet spot of around $200; the Nighthawk R7000P comes to mind. Cheap is expensive. A good device can give you service for a number of years. The very cheap ones are risky – for instance, over time they can cook themselves in their own waste heat. You end up with just a brick, a box that does nothing. Remember that cheap devices are unlikely to get regular security software updates from their manufacturers. As a result, they are easy to hack, and are often turned by hackers into bots which they manipulate to carry out malicious schemes on the internet. Cheap ones are also more likely to freeze or crash when you are using them. Imagine your router crashing mid-game and having to be rebooted. They also wear out faster and require replacement more often than the best-quality devices. Q: Tell me more about MU-MIMO and SU-MIMO. A: MU-MIMO stands for Multi-User, Multiple Input, Multiple Output, while SU-MIMO stands for Single-User, Multiple Input, Multiple Output. The simple explanation is that Single-User MIMO serves one device at a time while Multi-User MIMO serves multiple devices simultaneously. One of the requirements of SU-MIMO technology is that a Wi-Fi device must have multiple antennas to facilitate the sending and receipt of multiple streams. MU-MIMO technology allows wireless devices to transmit and receive data from multiple Wi-Fi devices simultaneously. The devices must also support MU-MIMO technology so as to use it; but they do not need to perform as much signal processing as with SU-MIMO (which saves on space and power in the device). Q: Tell me more about Plex. A: Plex is a client-server media player system and software suite that helps you organize your videos, photos, audio files and so on, enabling you to access and stream the contents of your collections from anywhere. Plex collects the metadata of stored files and automatically organizes all that information, enabling easy sorting and searching of the content you want at a particular moment. Previously, Plex Media Server ran only on PCs, NASes, and through Plex’s Cloud Service. 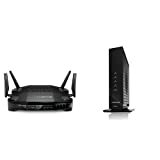 But you can now access it via the Netgear R9000 Nighthawk X10 (our step-up pick). This device supports Plex Media libraries on network shares in addition to libraries on its attached USB drive. A: The terms “ping” and “ping rate” are familiar to gamers and form part of their regular gaming lexicon. A bad ping rate is when other players keep disappearing, appearing, jumping around, and so forth. It means you have a high ping rate – you want it low. Put simply, ping is a measure of your connection speed. A measure of the latency of your connection. Fast, responsive internet connectivity does not depend only on upload and download speed. Ping plays a role too. Ping is reaction time. For instance, you may have a ping of 98ms, which means your computer takes 98 milliseconds to respond to a request made by another computer. So when you are gaming, you want your computer to respond as quickly as possible: to have a lower ping, because that is what will give you an edge over your competitors. If your wireless router has a ping below 20ms, that’s impressive. If it’s doing 150ms, then you will have some lag, putting you at a disadvantage in online gaming. One way to reduce ping is by closing all programs and windows on your computer, except your game, ensuring that there are no active downloads running in the background. If you are sharing the connection with others, your ping rate is going to suffer. The fewer devices are connected and using the wireless router’s internet connection, the better your ping rate will be. A: Beamforming technology focuses a Wi-Fi signal in a specific direction. This contrasts with the traditional broadcasting of data in all directions. Beamforming enables the wireless router to determine where your client device is located and then projects a stronger signal in that specific direction. This efficiency enables the device to provide a stronger Wi-Fi signal that has a longer range for each device. A: Wireless backhaul consists of the network infrastructure and wireless communication that transmits communication data from end users or nodes to the central network/infrastructure and vice versa. It enables smaller networks to connect with the backbone of the primary network. Q: How do I carry out setup and network maintenance of my device? Don’t use the domain names your devices manufacturer has provided to access its Web-based configuration screen. They can get hijacked by hackers. Connect your computer to the router, and type in its IP address in a web browser. If you don’t know its IP address, this article will tell you what you should do. Use WPA2-PSK (AES) encryption. It provides excellent speed and security for Wi-Fi networks. If you are working with an older device that does not support WPA2, use the router’s mixed mode setting – that is AES and TKIP. Check if there is any firmware update available for your device. Ensure you recheck regularly (every few months). Place the router in a central location, not in the corner, basement, attic, and so on. You don’t have to adjust the antennas. They are omnidirectional. A change in antenna position can get you at most a 2dBM gain or loss, nowhere near enough to fix a problem if there is one. Your router’s band steering feature will help steer clients to the appropriate band frequency (2.4GHz or 5GHz). If your device lacks this feature, you can do it manually – just don’t overload either frequency with too many devices. If you are using a PC or Android, use the app Wi-Fi Analytics to optimize your network and ensure you have correctly configured the Wi-Fi networks. If you are using Open Source or Android, use WiFi Analyzer. If you are on a MAC, use WiFi Explorer. In case of connection issues, try using different devices. If the Wi-Fi works on other devices but doesn’t on a particular laptop or desktop, check the computer’s drivers. Ensure it has the latest drivers for the Wi-Fi card. You can get them either at the laptop manufacturer’s website or from the Wi-Fi card’s manufacturer. Q: I want a wireless router to use when I am travelling – which is the best? A: We did a review of the best wireless routers for travelling. Check it out. Q: Can you give me examples of Wireless Network Standards and what they do? WPA – Stands for Wi-Fi Protected Access. It improves upon the security features of WEP (Wired Equivalency Privacy, a security protocol of the 802.11b standard). It has improved data encryption through the TKIP (Temporal Key Integrity Protocol) and user authentication through EAP (Extensible Authentication Protocol). 802.1x – It improves the security of LANs by providing an authentication framework which enables users to authenticate to a central authority. 802.11a – It is an extension of the 802.11 standard. Found in WLANs, and supports a maximum connect rate of 54 Mbps throughput in the 5GHz frequency band. 802.11b – It is an extension of the 802.11 standard. It is usually found in WLANs, and supports a maximum connect rate of 11 Mbps with fallback to 5.5, 2, and 1 Mbps in the 2.4GHz band. 802.11g – It is an extension of the 802.11 standard which allows for a maximum connect rate of 54 Mbps and maintains compatibility with the 802.11b standard in the 2.4GHz band. 802.11i – It is an extension of the 802.11 standard which provides improved security. It uses improved encryption methods and advanced encryption mechanisms such as AES (Advanced Encryption Standard). 802.11n – It uses multiple transmitter and receiver antennas (MIMO) to allow for increased data throughput and range. In conclusion, if you can’t live without Netflix and other streaming services, our pick for the best wireless router the D-Link Ultra AC5300 (model no. DIR-895L/R) will satisfy you. We recommend it for its speed, high-quality gaming experience, Wi-Fi reliability and many more good attributes.